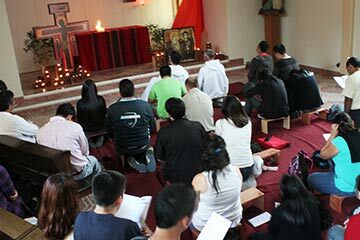 The 8,000 young adults from most of the countries of South America, from North America and from Europe who took part in the meeting in Santiago, Chile, went off with a question: how can we continue to live in our daily lives what we have understood of the Gospel through this stage of the pilgrimage of trust? In Chile everything starts at the end of the summer. The first Friday in March, a hundred and fifty young adults came together for an evening prayer in the parish in the neighbourhood of Santiago where the Taizé brothers continue to live. Perhaps during the preparation for the meeting in Santiago the style of the prayer and the songs were rather new; now everything is well known and the prayer is much more beautiful and intense. It was a very joyful occasion for it was an excellent opportunity to meet up with those who had taken an active part in the preparation in the parishes of Santiago. The following Saturday, we came together again, this time, to read the “Letter from Chile”. After a time reading the letter individually in silence, we split up into three groups according to the three options proposed in Brother Alois’ letter: joy, compassion and forgiveness. At the end of the afternoon, we had a prayer around the Cross. The prayer became a clear sign of our solidarity with the Japanese who are going through such great difficulty, so similar to what we went through one year ago. In one of the groups, somebody explained that these small meetings are not a sign of nostalgia for the big meeting last December, rather they are a step forward in the pilgrimage of trust: a step that allows us to continue to search together and to better understand the words of Brother Alois in the Letter, “Individualism as a road to happiness is an illusion.” Our responsibility is to continue to create friendship between Christians of various denominations, with believers of other religions, between believers and non-believers, between generations and between peoples, between those who have and those who have nothing. Several parishes have announced regular prayers with songs from Taizé. Another afternoon all together will take place on Saturday 9 April. During Lent, a “pause in God” is proposed every day; from Monday to Saturday, at 13.00: songs from Taizé, a light lunch in silence, a time to breathe and get your strength back in the middle of the day in a university campus: Iglesia San Lazaro, calle Ejercito 415, metros: Héroes and Toesca. Other initiatives are being prepared in other cities to continue the pilgrimage of trust.